If you had to choose between watching a video and reading volumes of information from a book, what would you choose? The majority of us would probably prefer watching a video. In fact, many educational institutions prefer using video-based learning to support their academic curriculum because they have realized that videos help students learn faster. Research has proven that the human brain processes visual information 60,000 times faster than text. This probably explains why this trend of using videos in learning is catching up fast in the corporate sector as well. In this blog let’s look at the different ways in which video-based learning can be utilized in the healthcare industry. Continual training is top priority in the healthcare industry. Videos can be used as an effective aid in blended learning programs. It’s a great way to combine auditory and visual enhancement with a traditional classroom-based training program. Flipped classrooms are increasing in popularity and might soon become the standard method to train workforce in the healthcare industry. For healthcare professionals located in rural areas in developing countries, a video-based learning approach might sometimes be the only solution, as it may not be feasible for them to attend an instructor-led training program. Let’s assume you are training a group of emergency responders on first-aid practices to be followed. Along with explaining the first-aid practices, if you could include a video demonstrating the first-aid procedure to be followed, it would make learning engaging and effective. According to Forrester research, one minute of an online video is equivalent to 1.8 million words. You only have to imagine the power a video-based learning program could wield on healthcare training. While you have the LMS to schedule your formal training programs, you often learn informally without even realizing it. The content presented in an informal learning program is not structured and certainly not instructor-led. It is essential for physicians and other healthcare staff to be aware of the latest practices and stay up-to-date with the latest information in healthcare. Videos are a great strategy to accomplish this task. For example, you could make use of video-based learning in the form of microlearning modules to help employees stay in tune with the latest trends in healthcare development. Video-based learning can take healthcare training to a new level. Sharing expertise and best practices is more important in the healthcare industry than in any other industry. For example, a video on a rare surgical procedure is something you would want to share with other surgeons. Whether it is to share with your employees on how to work through a diagnosis or show them the right way to enter data in the healthcare record system, videos can be used to share the best practices followed in the healthcare industry. There are patients who require at-home aftercare and caretakers are expected to be familiar with the right process to take care of the patient. Video-based learning can demonstrate the right procedures to be followed. There are awareness initiatives that you would want to share with people in order to keep them well-informed. Informative videos streamed on media channels and social media serve to educate people. Videos offer a unique way to learn, teach, and share information in the healthcare industry. 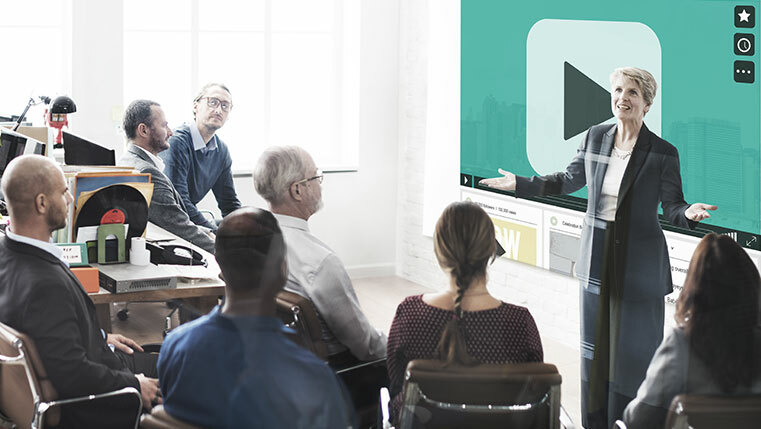 From improving communication skills to imparting technical knowledge, video-based learning is an important part of the training strategy in this industry. When you create or curate videos, they form an important part of the learning assets in the organization. The library of video assets can be uploaded to the LMS so that employees can search and access videos on-demand. Video-based learning contributes to the creation of a video assets library which can be used to provide just-in-time learning and performance support. Video-based learning is suitable for all kinds of training programs rolled out to the healthcare workforce. It is not surprising that many organizations are using video as the medium to reach out to their employees, even those in remote locations. How has video-based learning helped the workforce in your organization? Do share your thoughts through the Comments section.